Scott Peck in The Different Drum describes his own experience of the “isolation and fragmentation that have become the order of the day.” The aim with BCA is to combat the forces which separate people from each other, and disintegrate society. BCA can enable people from differing backgrounds to communicate more effectively, to release their innate creative gifts and enable others in turn to find greater enjoyment. Increasingly in the years since the second world war, divisions have widened between the rich and the poor. In spite of comprehensive education the divide between the private sector and the state system has increased. The ’80s saw great emphasis on personal responsibility and individual goals. Lip service is paid to the alternative to institutional provision of welfare — Care in the Community. However, lack of planning and inadequate funding has increasingly isolated those dependent on Care in the Community. Friends, families and neighbours have not been able to fill the gaps left by the closure of mental hospitals, or the mounting needs of the elderly and increasingly aged population, or those with physical or mental disability. Economic and social stress experienced by carers living in three -or even four- generation households serves to isolate both the carer and the cared for. Isolation breeds depression, stress, and breakdown in the increasingly fragile structure of our present day society. While for years lone voices have called for ‘investment in prevention’, there has never been a government able, even if willing, to do more than provide a minimal framework of provision, geared to crisis response rather than building up family or local networks of support either through the voluntary sector or statutory provision. By understanding that any one of us can initiate change, especially if we can come together with others who are also concerned, we cease to be consumers of other people’s policies and become the agents for change within our own lives and communities. It is possible to start a project with only two or three people, who ask themselves who else would be concerned? Who else might want to help us? In this way an ‘initiating group’ is formed. “We need both the comfort of friends and the stimulus of strangers. We relax in the company of people like us, but we also need a connection with a bigger and wider society both to keep us from falling asleep [our italics] and to make us feel part of something bigger”. Frequently in residential homes for older people, falling asleep has become the norm. The BCA process seeks to provide activities and new relationships which stimulate and contribute to a feeling of being valued within a wider society than the homogeneous group within the Home. Community develops where small groups come to know and trust each other. With self awareness comes the confidence to share our experience with others. However to make an impact on the wider community we need to identify those organisations — statutory, voluntary, residential or providing care in the home — who are willing to work as partners to create cross-boundary groups. Also we need to build community with business and through schools or colleges. Businesses are not separate but are in reality integral parts of our community and where many people spend most of their working lives. They should be seen, not simply as making money for shareholders, but as contributing to the fulfilment and wellbeing of all involved. Schools, working with young people who are at a crucial stage of their lives, forming their beliefs, values and identity, can very fruitfully allow children to discover a wider world and connect with people they would normally not have a chance to meet. 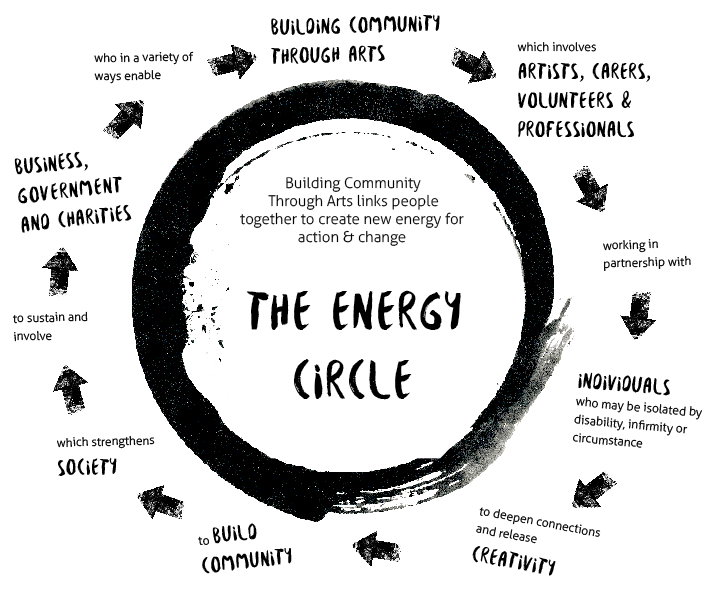 The BCA ‘Energy Circle’ shows the interdependence of all aspects of the wider community with which BCA aims to build community. Despite the many differences between us — in our workshops we include old and young, able-bodied and those with disabilities, professional and voluntary careworkers — we affirm our common humanity: “...for all that is human we have in common” (Franck). We start with the belief that more effective communication is achievable through the release of creative energy innate in each member of society. By raising awareness and understanding across boundaries, we believe the development of mutual respect can create ‘true community’, whose ultimate purpose is reconciliation rather than confrontation (Scott Peck, The Different Drum) generating throughout society ripples of tolerance, support and generosity of spirit.